I posted 43 different recipes ! Don't forget to check the older posts! so I know you stopped by! Discovery Women tried this recipe I posted before. And she sent the picture to me ! 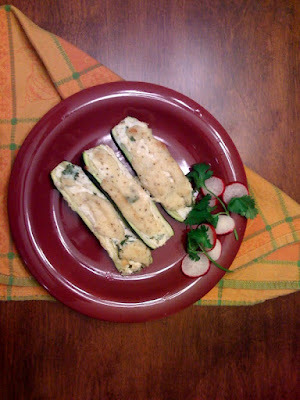 If you'd like to try this recipe please read the comments of zucchini gratin for better taste! do you like spinach with yogurt? If you ask what is my favorite vegatable, I should say spinach! My hubby, my son we all love spinach. Raw or cooked, doesn't matter. Here is an easy recipe which yogurt gives spinach better taste. Wash the spinach and chop it into pieces. Place in a large saucepan. Add the onion and garlic, covered, cook about 5 munites. Shake the pan frequently. Add the olive oil and cook 3 more munites. Stir constantly. Remove from the heat. Sprinkle with crushed red peper or sumach and serve hot. Enjoy! I love autumn in Long Island. grey,rainy(sometimes 4-5 days) so boring! (i got this recipe one of my friend,haven't tried yet. that's why i 'm publishing without photo). Sounds good. If anyone try before me please, please write a comment. Peel the zucchinies and cut them half in lenghtwise. Remove and discard the seeds. Combine the filling ingredients and fill in the zucchinies. Put oil in a small bowl. Add the flour and mix with a wood spoon. Add milk(warm) and stir slowly. Cover the zuhuccinies with this sauce. Cook in preheated oven(400 F) untill tops are golden brown. Yesterday I went to Stop &Shop. All you need stop n shop saving card, all antibiotics are free! By the way If you don't health insurans, Ride Aid offeres big, huge saving with Ride Aid Card. with saving card 90 tablets only $ 15! In a large saucepan cover chicken with water. Bring to boil. Cook till tender. Remove chicken from bone. 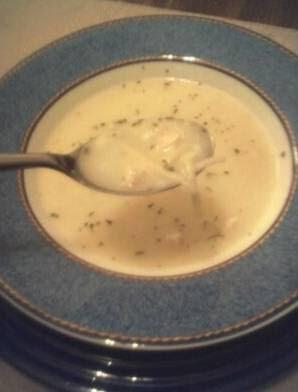 After chopped add chicken and noodle to the broth. Meanwhile, mix half in half, flour, spicy, garlic, lemon juice in a small bowl. Add the mixture to the soup and stir occasionally. Cook 5 more munites. Ready! Spring makes me feel tired! It happens every year. So I was thinking why autumn doesn't give this feeling but spring. Is it happening only me? That was a long and cold winter in Long Island. So I hope we have a long summer which i really missed. 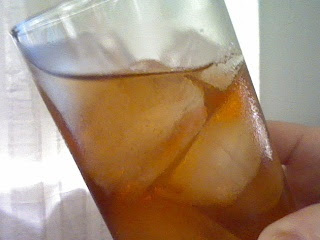 Barbeque, iced drinks, beaches, pools, summer nights..
Now I am having peach iced tea.